Pig and the Accidental Oink! is the book that started it all. 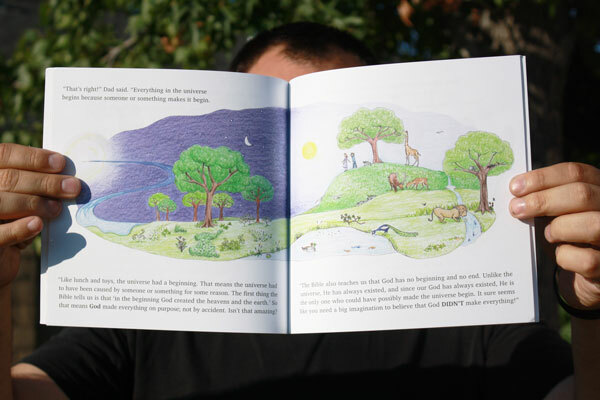 The initial book of Picture Book Apologetics was funded with Kickstarter on August 30, 2013, and since its publication has been followed by 4 more published titles and 2 nearing completion. This isn’t like other children’s books; it presents deep apologetics topics at a basic, introductory level. Before you can build a house, you need a foundation, and these books are your tool to begin doing so. Pig and the Accidental Oink! presents the case for the universe having a starting point and that that starting point is a creator. There is a section for adults with further resources as well as suggested activities to help kids retain and understand the concept. We wrote, illustrated, designed, and published Pig and the Accidental Oink! from start to finish after carefully seeking feedback from scholars and apologists, as well as parents and children. Spanish translation available (in print and as PDF download). Where to Get Your Copy of Pig and the Accidental Oink! Pig and the Accidental Oink! is available for sale on amazon.com, and has been translated into Spanish and Ukrainian. This entry was posted in Sneak Peeks and tagged apologetics for children, apologetics for kids, cosmological argument, kalam, picture book, pig and the accidental oink.